I first discovered henna when I was 12 years old. I was at a cultural fair and received a strange squiggle on my hand in a strange muddy paste. When it dried and fell off it left a really strange orange mark. I had no idea what this paste was, but I knew I wanted to learn more. Late in my late teens when I had left home and was attending college in a small hippy town, I found a do-it-yourself henna kit. I immediately bought it and brought it home and smeared the past onto my skin in a giant blob. I knew I still wanted to work with henna but I knew this was not the way. A few years passed and I ended up living in Japan and of all the places to find a teacher of this Indian and Middle Eastern Art it was in Japan! I studied with my teacher for just a few classes where she showed me how to mix the paste, how to apply designs and overall be a better artist! After living and studying in Japan, I brought my art to North Carolina where I started hennaing at a small yoga studio, I was a hit! and I was being booked regularly! Soon it was time to move and I relocated to Arizona where I hennaed brides, mothers to be,dancers and became active in the festival circuit, hennaing many people at places like the Estrella War, Faery Festival and even public libraries! I was soon picked up by a party planner who would book me for weddings, corporate events and even high school proms! All that hard work finally paid off and not only was I in high demand in the Phoenix area but an international magazine L3 asked me to henna a model for a 4 page spread in one of their editions! Today I am living south of Portland, Oregon where I take private appointments and large creative henna pieces. Often times called “Henna Tattoo,” Mehndi is the beautiful art of applying Henna paste in an intricate design on to the skin. Used for 1000’s of years, Henna has been applied to hair and skin for a beautiful, natural dye that ranges from red to golden brown. 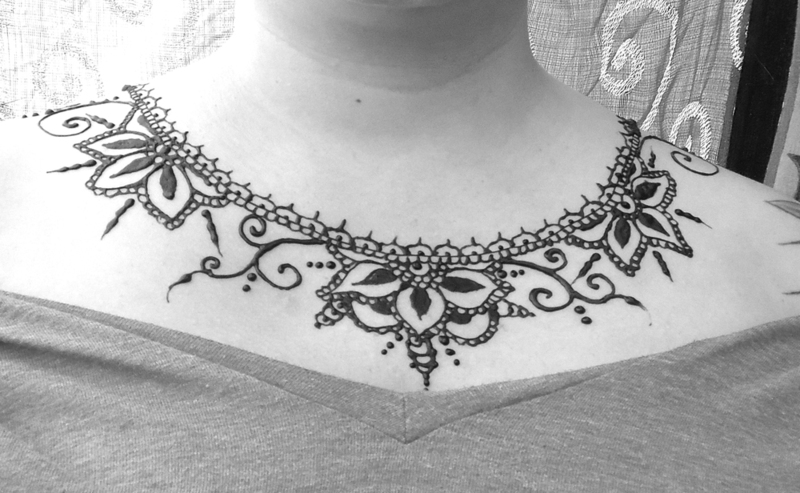 When applied to skin, Henna has a temporary effect; creating a design that lasts for weeks. 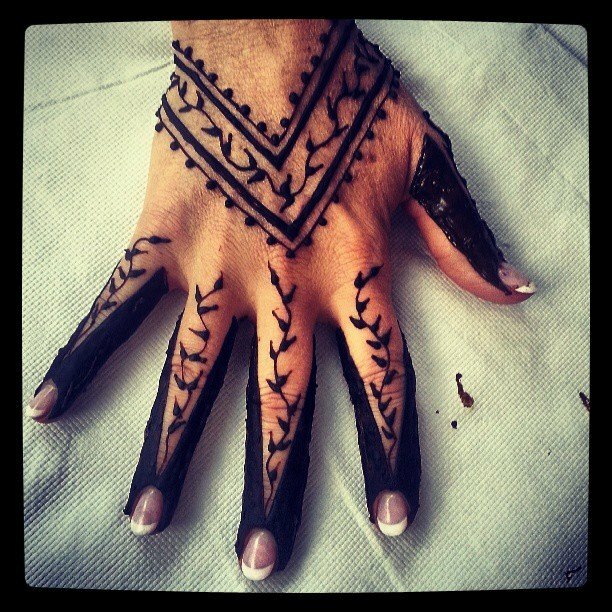 Henna is a natural plant, and only natural ingredients are used to mix the henna paste, though like many natural plants allergies may occur. Please inform us of ANY allergies you may have. Henna cannot be applied to small children or babies. All of my designs are hand drawn on the skin and are all original art,often times created on the spot. I free hand all Henna art work, though basic designs are available, custom art is preferred. Price by size is best suited for women's parties, adult parties, private appointments etc. A minimum of $100.00 is required for me to travel to the location. This is a great choice if you are looking to have a few large designs done between a few friends. 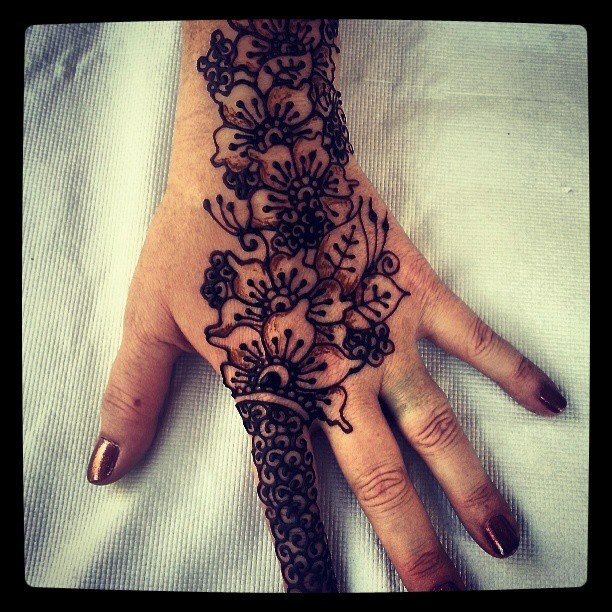 For example, if 4 people at the party got a medium henna each, it will cover the minimum amount. It is also a good choice if different size designs are needed for your event. Professional design books are brought to the event. Traveling fees may apply. Any appointments that is under $100.00 must travel to my location, which is south of Portland. Prices range from $10-$65 per design. Price by hour is best suited for corporate events, large parties bridal showers, and belly blessings. The benefit to pricing by hour, is that your guests will not have to worry about payment, I can complete about 20 small designs or about 10-15 medium in one hour. To find out what is best for your event please contact me by phone or e-mail. Limited design choices are available for corporate events and large parties. Professional design books are brought to bridal showers and belly blessings. Traveling fees may apply. To inquire or book an appointment please send your inquiry to WatersofAvalon@gmail.com. Traveling fees may apply to any event that is located outside the greater Portland area. A fee of $25.00 per hour of driving will be applied to all events. Please contact me for more information.